4 Beds 5 Baths 1 Partial Bath 3,870 Sq. 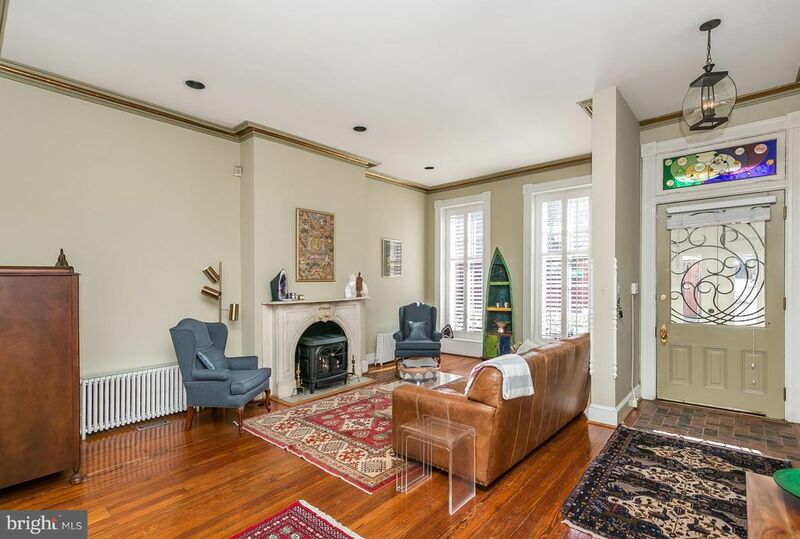 ft.
Picturesque and Light Filled, End of Group Townhouse overlooking the coveted John Street Park in Historic Bolton Hill. This is a non-thru street with a beautiful serene fountain and benches to enjoy all year long. The house has 4-5 Bedrooms, 4.5 Baths, Finished Lower Level Family Room, Au-pair or In-Law Suite in Lower Level, 2 Master Bedroom Suites, Renovated Kitchen, Updated Baths, Wood Floors, Original Details including Beautiful Mantels and Moldings, Gas Fireplace in Living Room, Wood Burning Fireplace in Kitchen, Plantation Shutters, Private Deck overlooking a lovely Walled Brick Courtyard and Garden for your Urban Oasis. Zoned Central AC, 4 Zones of Gas Heat. Convenient to Penn Station, MARC Train to DC, AMTRAK, Light Rail, Subway, Hopkins Shuttle, MICA, Cafes, Restaurants and everything to Penn Station, MICA. Baltimore has to offer. Ample Street Parking. Subject to the Midtown Benefits District Surcharge Tax.